Samsung Galaxy S7 is the best Android smartphone at the moment with the most advanced technology, durable design, beautiful photography and especially Samsung Galaxy S7 cabable of water resistant according to IP68 standards. About design, the Galaxy S7 has not much changed compared to the S6, but Samsung Galaxy S7 was improved hardware and software. 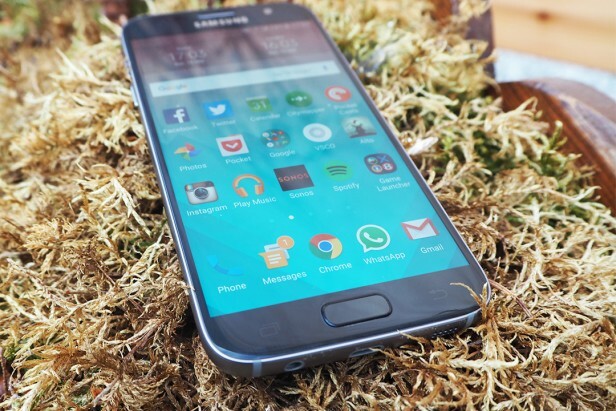 The Samsung Galaxy S7 is the top Android phone you can buy right now. It has a better camera than the LG G5, a design that’s as sleek as the HTC 10 and it should have the team working on the iPhone 7 very worried. 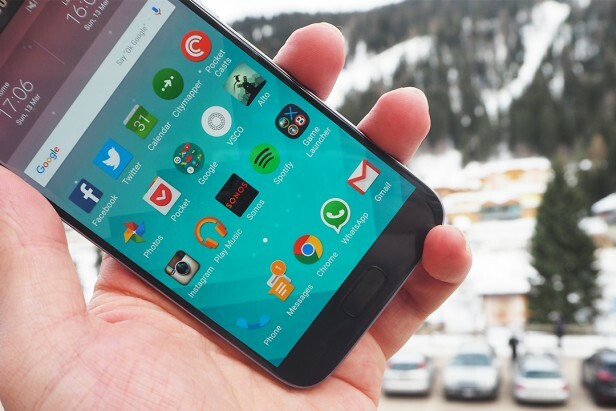 Yes, initially the upgrades over the Galaxy S6 might seem minor. But they make a huge difference. The camera is faster and sharper, the curved back easier to hold and battery vastly improved. There are other great Android phones, like the Nexus 6P, but the Samsung Galaxy S7 is the most complete one you can buy right now. After the massive, and much needed, change in design direction Samsung took with the Galaxy S6 and Galaxy S6 Edge in 2015, all rumours pointed to things staying pretty much the same for the Galaxy S7. Well, it’s not like Apple, HTC or Sony make drastic changes to their industrial design every year. And that’s exactly the case here. Place the Galaxy S7 next to the S6 and you’d be hard pushed to instantly pick which one is which. Frankly, this doesn’t bother me in the slightest. 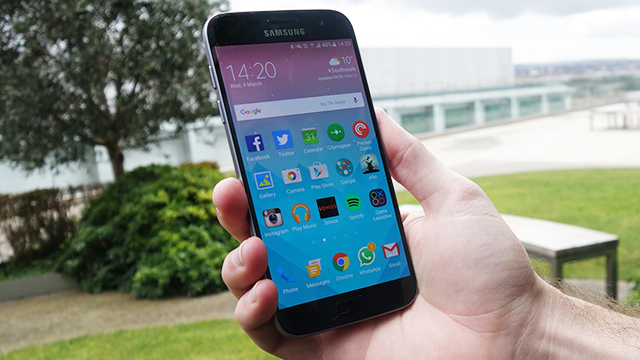 The S6 was already one of the best-looking phones around, and the Galaxy S7 follows suit. Both the front and back are covered in Gorilla Glass 4, while a metal rim snakes in between. Two volume buttons sit on one side, with a lock/standby switch on the other. It’s a clean look, with the back free from any markings aside from a Samsung logo. The camera lens now sits just about flush with the glass body too. This might seem a small change, but it makes a big difference. I can now tap out an email with the phone flat on my desk without it jumping and rocking from side to side. There is one notable design change on the back – the sides now curve ever so slightly, just like they did on the larger Galaxy Note 5, and it makes a huge change to how the Galaxy S7 feels. 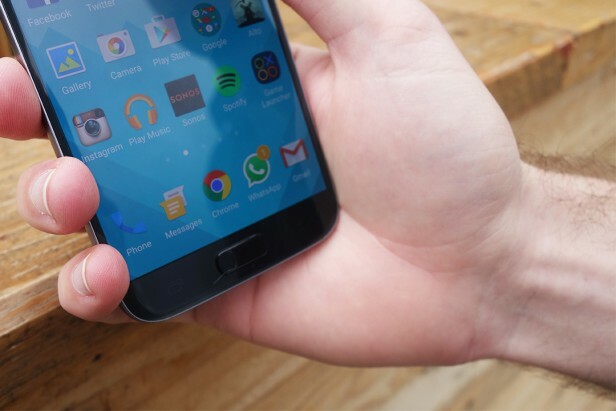 While the S6 felt harsh and rigid, the Galaxy S7 slips softly into my palm. It’s so much more ergonomic and makes picking it up off a flat surface much easier. And the way the sides almost melt into the glass just looks damn cool. Good job, Samsung. It’s an absolute fingerprint magnet, though. After a few minutes of use, the entire back becomes a grubby mess that needs wiping down with a microfibre cloth. It had been suggested that Samsung would make a big switch to the new, reversible USB-C connector that’s already being used on the Nexus 6P, OnePlus 2 and LG G5, but it hasn’t. To be honest, USB–C is more of a hindrance than a help at the minute. You can’t use any of the cables you’ve picked up over the years and it doesn’t necessarily mean faster charging. It does mean the S7 isn’t quite so future proof, though. The front again has a clean look about it. The elongated home button still sits under the display, and it still juts out ever so slightly, rather than being concave like the iPhone’s. For me, this is a plus – it feels better pressing the Galaxy S7’s home button than the iPhone 6S’s – but a couple of the TrustedReviews team think otherwise. They’re wrong, of course, but it’s interesting how such a small design choice can split people. Housed inside the home button is a really fast and accurate fingerprint sensor that matches the iPhone 6S’s for speed, but it’s marginally slower than the Nexus 6P’s. That difference is minimal, though, and something you would only notice if you had the two side by side. It’s clear from the Galaxy S7 that Samsung is listening to customer feedback and bringing back favoured features from the Galaxy back catalogue. MicroSD expansion is one, and IP68 water resistance is another. The latter is by no means a vital feature, yet it’s impressive that it’s been added without any forced changes to the design. There are no flaps, there’s no added thickness and no extra space between the display and glass. What does an IP68 rating mean? Well, you’ll be able to dunk the Galaxy S7 into 1m of water for up to 30 minutes without damaging the phone. Or, if you’re like Lil’ Wayne, you can douse it in multiple bottles of champagne. Obviously. It’s become a cliche that phones get thinner and thinner each year, but that isn’t the case with the S7. It’s marginally thicker than its predecessor and has a nice weight to it. It feels dense and expensive, though not as delicate as you’d expect from a phone with glass on the front and back. I dropped it about four foot onto a hard floor and it survived without any problems. Samsung has stuck with the same 5.1-inch display, there’s the Galaxy S7 Edge if you want something bigger, and it’s refreshing to have a flagship phone that feels this compact and easy to hold. It’s roughly the same size as the iPhone 6S, which only has a 4.7-inch screen, and much smaller than top-end devices from LG, Huawei and Google. Coming from using the S7 Edge, I was initially a little underwhelmed by the Galaxy S7. It didn’t quite have that wow factor its curvier sibling does. But after a while it became my favourite phone to use on a daily basis. It feels great, is the perfect size and doesn’t make any sacrifices – aside from maybe the speakers – to get there. Close to perfection. That’s the best way to describe the display on Samsung’s Galaxy S7. Not much has really changed from the outgoing S6, but this still holds up as the best screen on a smartphone. It’s still a 5.1-inch QHD panel with a 2560 x 1440 resolution, and just like every Galaxy flagship so far, it uses Samsung’s Super AMOLED tech, rather than the more common LCD. AMOLED displays are a lot better at showing off blacks than LCDs. Instead of looking slightly grey and washed out, the blacks here are inky deep. Some say AMOLED screens produce colours that are too oversaturated, so reds will look way brighter than they should, but that isn’t much of an issue here. And if you really prefer things toned down, there’s a picture setting for that. Having so many pixels jammed into a relatively small space means you can’t really spot one pixel from another, and that sharpness makes everything from gaming to watching YouTube an absolute pleasure. Play a round of Alto’s Adventure or Monument Valley on this display and you’ll instantly be drawn in by the crisp details and vivid colour reproduction. I wouldn’t normally watch a film on a screen this size, but the panel here is so gorgeous that I can’t help getting lost in it. The one thing that has changed this time around is the addition of a new ‘Always-on’ display. 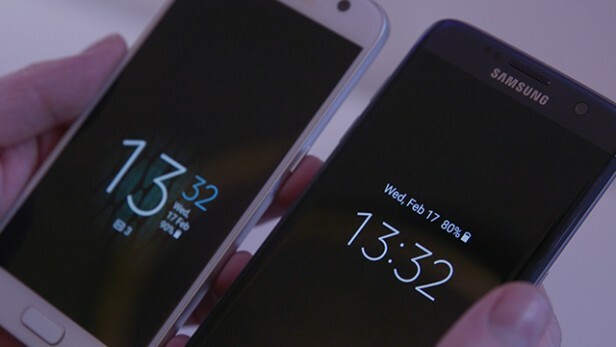 Due to the way AMOLED screens work, they don’t need to light up the whole display all of the time. They can select individual pixels and just show them, keeping everything else off. So, when the Galaxy S7 is locked it can still show the time, date and a couple of bits of other information on the screen without eating through too much battery. It’s a nice touch, and great for quickly checking the time when the phone is resting on your desk or a bedside table. But it’s a good software update or two short of being really useful. First off, it’ll only show notifications from a few apps – it’s currently limited to Samsung’s own Messages, Email and Phone. If you, like me, regularly use WhatsApp, Gmail and Facebook Messenger, none of these will appear. That’s a shame, and makes the notification side of things a lot less useful. I’d also like a lot more control over the mode. There’s no setting to alter the brightness, which causes some problems when you’re in a darker room, and aside from choosing whether or not you want a calendar showing, there’s no customisation allowed. It uses extra battery too. About 1-2% per hour, so 15% or so per day. It’s just about worth it, but it could be so much better. My only gripe with the display on the Samsung Galaxy S7 is that, in sunny conditions, it can be quite hard to read – certainly more so than the LCD panel on the iPhone 6S. Even with the brightness jacked all the way up, you’ll have to tilt the screen or find some shade to stop yourself squinting at it. Thankfully, unlike the Galaxy S7 Edge, it has great viewing angles and doesn’t suffer from white backgrounds getting tinged with blue. And You? 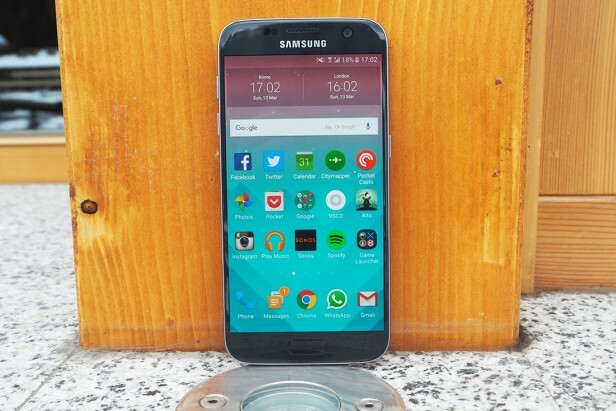 What do you think about Samsung Galaxy S7? Do you want to buy it right now?